I've always dreamed of sleeping beneath the stars. But never would I have thought I'd do so shivering in my cocoon of a sleeping bag in 20-degree weather. Three days before Thanksgiving, I had every intention of lying on the couch all day feeling pitiful for not having any plans—until Kathy from Arizona Outdoor Women posted in the Women on Adventures Facebook group that she had a recent opening for a three-person backpacking trip up to Paria Canyon. A glance at Google search images had me jumping to accept her invitation—having no idea of what I was getting myself to. My excitement diminished a little when I looked at the weather forecast—40s during the day and 20s at night—and a little more when Kathy told me we'd be trekking through mud and water up to our knees. I scrambled to gather every warm article of moisture-wicking clothing I had, and borrowed what I didn't. White House campground between Page, Ariz. and Kanab, Utah. By the time we got to the White House campground Wednesday night, I had hope that I'd be warm enough to enjoy the trip. My hope didn't falter even when I found out we were "cowboy camping" (camping without a tent). Probably because I was so excited about sleeping beneath the stars that speckled nearly every inch of the navy sky—so visible we could even see the Milky Way. That hope vanished when I woke up in the middle of the night shivering beneath the frosted tarp that blanketed the three us. For some reason, I thought my 40-degree sleeping bag would be fine in 20-degree weather. When my toes started to go numb, I caved and slept the rest of the night in my car—although it wasn't much warmer. I was revived in the morning by hot coffee and freeze dried biscuits and gravy. Since the plan was to backpack out at White House campground, we left my car there and Mary (Kathy's friend) drove us to the Stateline campground, just a couple miles from Wire Pass trailhead where we were to start our backpacking trip. We set up camp and walked a few miles down the Arizona Trail, appreciating the variety in scenery as we climbed the hill. By the time we got back, we no longer had the luxury of the sun shining on our campsite. The chill had me and Mary reading inside her car to stay warm, while Kathy showed us up by exploring the area more and later cooking dinner for us. She made an innovative meal of quinoa rice, chicken, and dehydrated peas—followed by a surprisingly tasty freeze dried chocolate mousse. That second night proved to be colder than the first, despite the tent and body heat we didn't have the night before. All of us had trouble sleeping once the cold peaked at midnight—so much so we decided to abandon the backpacking trip for a day hike and a night in a hotel. Since we now had an extra day to account for, we went into Kanab to try for The Wave lottery—giving up once we saw the hundred plus people packed into the tiny office. After a quick stop for water (and coffee and potato chips) we headed back White House campground and began our day hike into Paria Canyon. This was one of the most adventurous hikes I've done, having walked through sand, ice, and everything in between. Views and flora fauna became more beautiful around every bend. We stopped for a lunch of sausage and brie beneath a massive Cottonwood tree that looked out of place among the rugged shrubs around it. The tree's fallen leaves made the area smell like Autumn, which I found surprisingly comforting. We continued into the canyon after lunch. As the walls began to narrow, the shadowed canyon and the river between it became much colder—cold enough to lose most of the feeling below my ankles. I'm not sure exactly how far we walked, but we reached the narrows of the canyon when the sun was beginning to set, which created glowing orange reflections as it shone on the ruddy canyon walls. We got back to the trailhead just before sunset, and discovered the true meaning of comfort in dry clothes and socks. We drove into Page to find a hotel and grab a bite to eat, only to find that every hotel was booked. We were about to head to Flagstaff when Mary found the last room at the High Desert Lodge about 15 miles outside of Page. It was the kind of quirky, highway-side hotel whose typical emptiness warrants pity as you drive by it—but I've never been more grateful for a hot shower and a warm bed to sleep in. 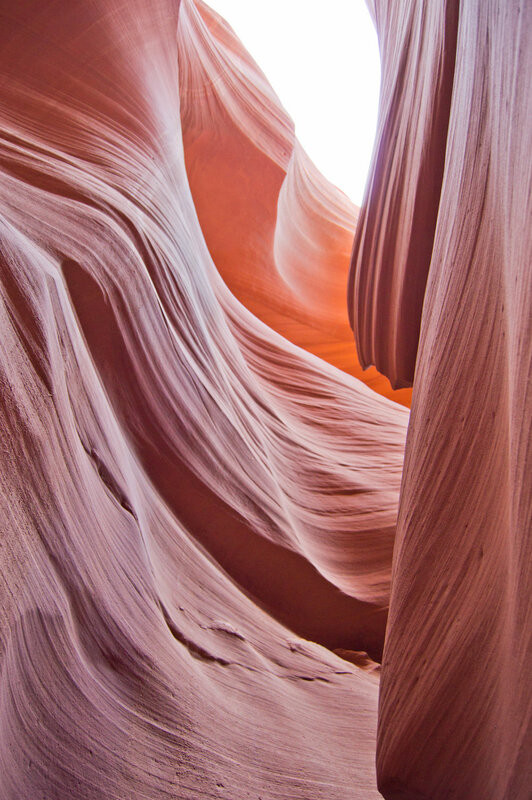 The next morning we decided to visit Antelope Canyon, a place that's been on my list for awhile. 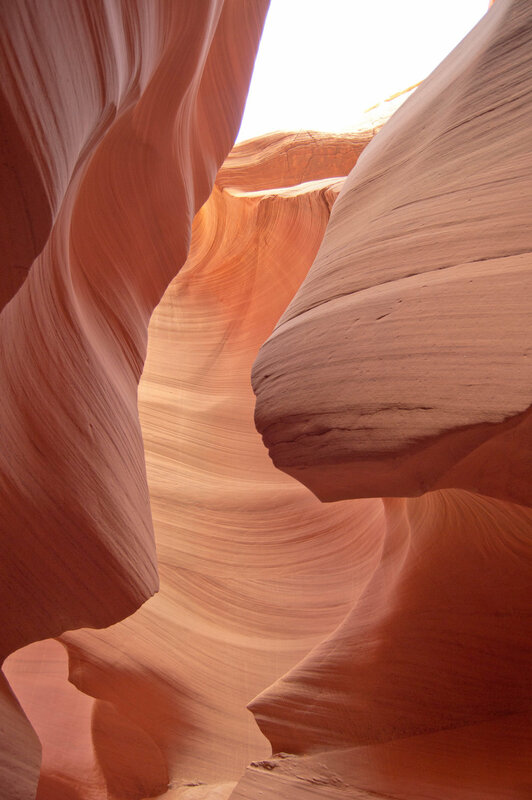 We opted for the less popular, more affordable—but supposedly just as beautiful—Lower Antelope Canyon. There were only two tour companies, so we got in line for the Dixie Ellis one that was closer to our car. If I ever go back, I'll go with this company again—just for the chance to get the same tour guide. Quintana (Tana, for short) embodied what every tour guide should be. She was personable, talkative, and never let a dull moment settle during the tour. She included a demonstration of how the the American Southwest's canyons and buttes were created that, using only dirt and a water bottle, made us all ooh and aah in admiration. She also helped all 16 members of her group set our camera and phone settings to capture the optimal colors of the stunning canyon. I hope you're one day lucky enough to visit a place you've long dreamt of seeing in person. There aren't many experiences that can compare to fantasizing about a place you've only seen in pictures, and then standing right in front of it. You have in your mind this image captured by other people, strangers even. But when you see it in person, you're able to absorb everything about the place—smells, sounds, sensations—while working through the emotions of your dream coming true. That's what walking through Antelope Canyon was like for me—even though I shared it with a mob of people. It was more beautiful and awe-inspiring than these pictures can even begin to capture. After that I made my way home, enjoying my favorite drive through Arizona's varied landscape and watching the mountains and Pines turn into boulders and Saguaros. This post was originally published on Laura's blog.